I’ve been involved in all of Simply Theatre’s productions either acting or producing or sometimes both! I started the group back in 2005 and it’s gone through many changes to get where it is now. We’ve been “Simply Theatre” officially since 2010 and the group is great. I normally like to be in the shows and have had some great roles. The only one I’ve not acted in is “Spring Awakening” but I was Producer. 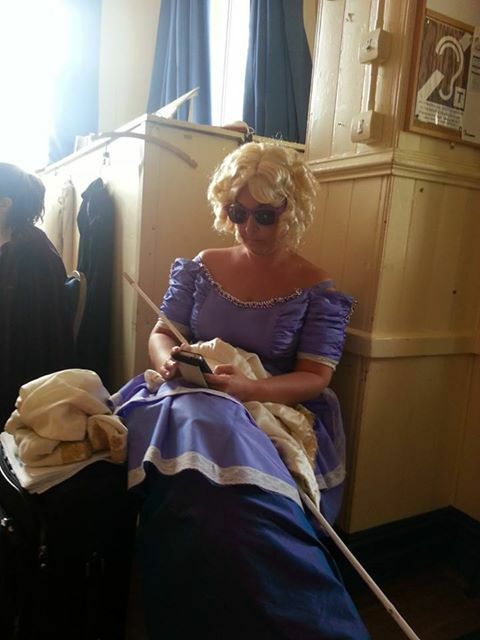 I play Florinda – one of Cinderella’s Step-Sisters. She’s beautiful (the script says that, not me) but not a very nice person. She likes to make Cinderella’s life difficult and pick on her as much as possible. She has a sidekick & Sister called Lucinda who also likes to taunt Cinders but actually I don’t think Florinda and Lucinda particularly like each other that much either! They do, however, have excellent hair! Did you know much about ITW before you auditioned? Yes, I absolutely LOVE the show! This is the second production I have been in, the first time I played Jack’s Mum and even made it on to the front cover of the Amateur Stage Magazine!! I first saw it with Bernadette Peters playing the role of The Witch and was absolutely mesmerised and thought I HAVE TO DO THIS SHOW!! I’m so excited to be doing it again. There are so many great parts to it but any scene involving The Princes – they are hilarious! Craig & Jon are so good at playing them that I think they’re going to steal the show. Worst Play & Part – The back end of a camel in Pantomime!